As you may know, ActivePresenter allows exporting projects to many output formats, including HTML5, videos, and PowerPoint slides, etc. 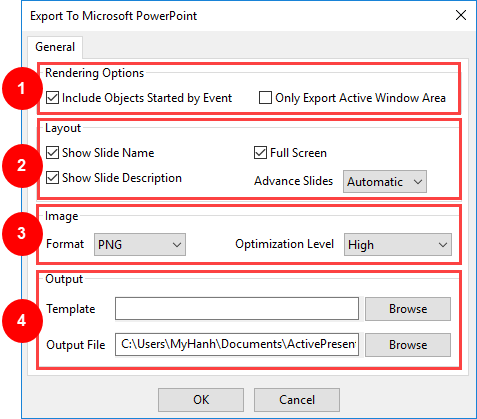 This tutorial will guide you how to export to PowerPoint presentation. In general, you can use this feature to convert an ActivePresenter project to a PowerPoint presentation with slides converted from ActivePresenter slides. After exporting, all of the objects (including placeholders) and their properties remain unchanged and you can edit them as normal. However, you cannot edit objects inserted using Slide Master. In other words, any object inserted into Slide Master will be flattened and merged into the background image of the PowerPoint slide. How to Export to PowerPoint? To export the project to PowerPoint Presentation, open the Export tab, and then select Microsoft PowerPoint. This opens the Export to Microsoft PowerPoint dialog containing options for the exporting. You are able to choose which types of object to export from here. Include Objects Started by Event: The exported PowerPoint presentation will include objects which are started by events. Your projects may have events and actions that you assign to some objects. For example, a shape that only appears when learners trigger a particular action like clicking a particular button. Only Export Active Window Area: Only export Active Window areas and objects which are selected to export. Active Window is a feature used in recording video demos or software simulations with ActivePresenter. It allows detecting a specified window of the application that you want to record and then saving the information in the captured slide. For more details, take a look at Working with Active Window Feature. This section contains options to define the layout of the exported slides. Show Slide Name: Display the slide name in the exported project. Select this option makes it easier for you to view and manage the slide in the output. Full Screen: Open the PowerPoint presentation in full screen initially. Show Slide Description: Render the slide description. Advance Slides: Select between Automatic and Manual to view slides in the output. Automatic: Slides will be played automatically. Manual: Slide will be played manually. Users have to click to show other slides. You can choose the quality for the background of the exported slides. Format: Choose between JPEG and PNG. Due to their specs and compression algorithms, JPEG is best suited for pictures while PNG is best suited for computer-generated images (screenshots, drawings, etc.). Note: JPEG compression is lossy while PNG is lossless, so PNG retains crystal clear quality, but the downside of PNG is that it does not compress well with pictures (very big file size) and the decoding (when viewing) is slower than JPEG. However, screenshots are compressed better with PNG, the file has a small size and there is no quality loss. Optimization Level: These are relative compression levels. When testing the output, you should select None. On the other hand, when exporting the final output, Ultra is good to go. Note: This option is only available if you select the PNG image format. The higher the compression level, the longer it takes to export. Quality: Select a value in the range of 1% to 100%. The higher the quality, the larger the output file size. Note: This option is only available if you select the JPEG image format. If you want the exported project to have a particular template, click the Browse button next to the Template box and choose one from existing PowerPoint templates. Tip: Refer to Using Themes for more details about themes and templates in ActivePresenter. Finally, select a location to save the final output from the Output File box. That’s how to export an ActivePresenter project to PowerPoint presentations. Try it and let us know if you need support.